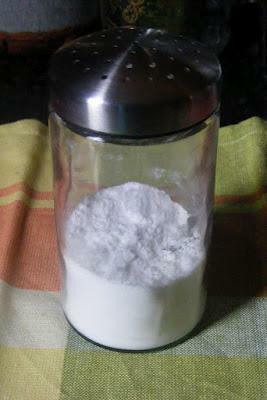 Take the baking soda and fill your jar 1/4 of the way up. Then, add 8-10 drops of your favorite essential oil. 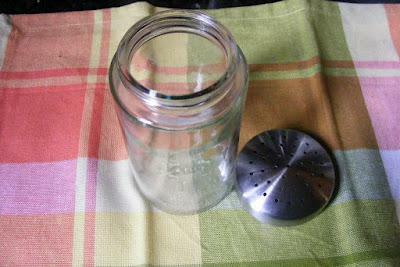 If the jar has a closed lid, you can punch holes in it with a hammer and thick nail. Or you can use a power drill with a small bit to make some holes in the lid. 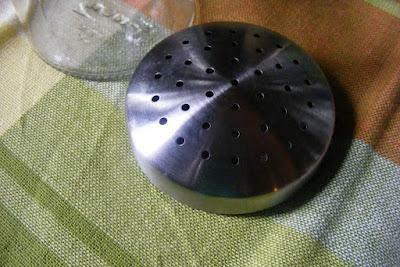 I was lucky enough to find this Ikea confectioner’s shaker, which already has holes in the lid! (If it looks familiar, that’s because I also use it’s twin in my kitchen to dispense baking soda that I use to clean my sink. You also can use a clay or earthenware jar, and it doesn’t have to have a lid, but I have cats that stick their faces in everything, so mine gets a lid!. This is really cheap and easy and isn’t full of those questionable chemicals that they put in those plug-in thingys! 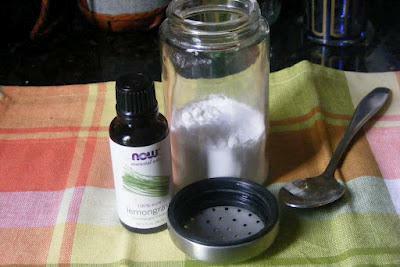 The baking soda is a natural deodorizer, and the essential oils are a nice natural scent. Whenever the fragrance dies down, just shake the jar a bit. I’m going to make another one that I will keep by the window in my bedroom with jasmine, so when I get a gentle breeze in the mornings, it’ll give the room a nice aroma. Try this one out and come back and tell me what scents you like to use, and what nifty containers you put yours in!